Summahhhhhh! Brilliant Frozen Daquiris - Bring It! “With a batch of these, and a peanut butter pie in your freezer you’re ready for anything.” That’s Sandy wisdom, and around here we love Sandy. First we love her for bringing her daughter, the fabulous Suzi, into the world. Before Suzi this neighborhood was a lot more like the Wizard of Oz before the Yellow Brick Road scene. Now, it is full on Technicolor. Anyway, we also love Sandy for bringing freezer daquiris into our lives. It is not unusual in our hamlet to see frozen Tupperware vats getting walked from house to house in the summer, the surplus from one party inspiring the next. As Sandy’s (also fabulous) son-in-law says, “The great thing is that it’s always just ready in the freezer. So, you know, at 2 or so on a Sunday after you’ve cut the lawn…” You might want to nab him for any serious chores before he cuts the grass. This is Sandy’s basic recipe, with some freelance suggestions. Mix together and freeze in a big rectangular Tupperware stirring every 2 hours. (Count on at least 10 hours and up to a day, depending on the container. I do not bother stirring it until just before serving.) Depending on the party you can use 3 cups rum*, and try adding stuff such as grapefruit juice. Now, here’s the brilliant part. Use this frozen block of daquiris as ice and internal structure when packing a cooler for the lake/cabin/weekend escape. At your destination chunk it up with a serving spoon or simply let it thaw into a pitcher of perfect drinkable slurpees. Lifechanging I tell you. And who do you think is always welcome back at that lakehouse? You got it. 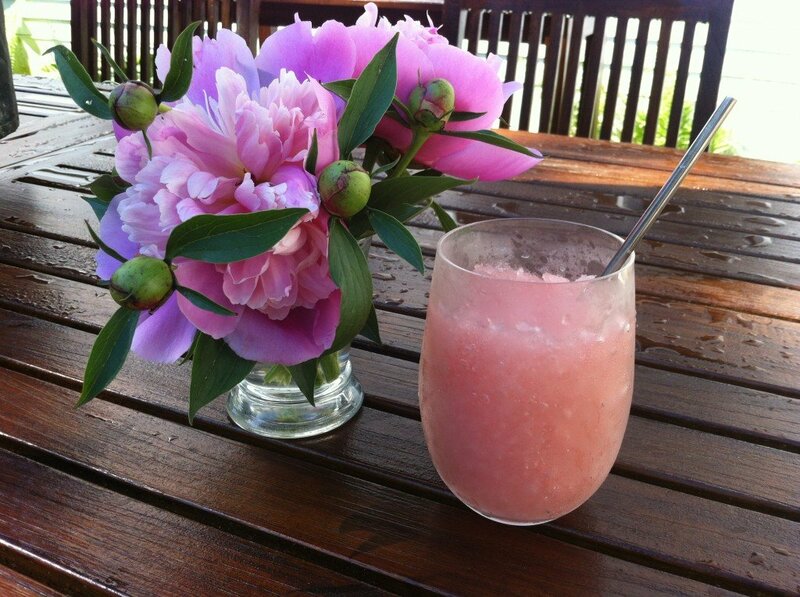 This entry was posted in Sips and Slurps and tagged cocktails, refreshments, summer drink on July 15, 2013 by Edie Morgan. Pingback: Spicy, Chunky Peanut Dip for the Fair | Bring It! Pingback: Hero Slaw | Bring It! Edie….I am beyond honored with your recognition of my daiquiri recipe as a first in your blog!!! Already this early a.m., you have brought me a few tears and some great belly laughs!! Your blog is going to be a smash..an absolute hit!!! Good luck with it…have fun with it! You will be an inspiration to women everywhere and now … You … Single handedly (sp ???) have given me a desire to get back into my kitchen, with the single goal of being published in Edie’s blog!!! GO GIRL!!!!!! Pingback: Watermelon Sangria | Bring It! Pingback: Hard Cider Sangria | Bring It! Pingback: Hot-cha-cha Pineapple Avocado Salad - Bring It!